Donald W. Rupert, partner in Marshall, Gerstein & Borun LLP's litigation practice group, will speak at the Center for Intellectual Property Law's 7th Annual Ethics in the Practice of Intellectual Property Law Conference. The conference will be held at John Marshall Law School in Chicago, Illinois on Friday, April 24, 2015, from 9:00 a.m. to 1:15 p.m. Mr. Rupert's presentation on malpractice issues in IP matters will begin at 9:30 a.m. For more information, click here. 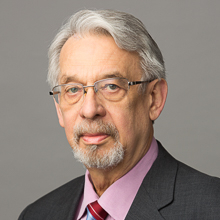 With more than 38 years' experience, Donald W. Rupert has handled over 100 intellectual property litigation matters in the chemical, consumer products, heavy equipment, pharmaceutical, and computer industries. He has been lead trial counsel in jury and bench trials and lead appellate counsel in IP appeals; he has also acted as lead IP attorney in commercial transactions having a cumulative value of over $15 billion. His skills have been acknowledged by Martindale-Hubbell® (AV rating), Leading Lawyers, and The Legal 500. Mr. Rupert was also recognized by Best Lawyers as a 2014 Lawyer of the Year for Biotechnology in the Chicago area and as the 2014 IP Lawyer of the Year (Midwest) by ACQ Global Awards.